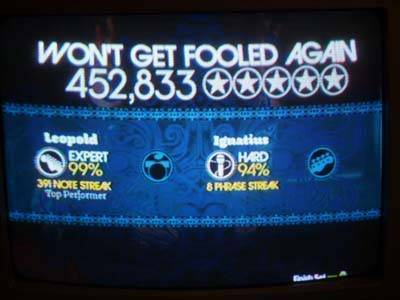 I Five starred (Don't Fear) The Reaper on Hard Guitar and Easy Vocals. Now I feel like I've accomplished something. BTW: I also failed Here It Goes Again with this same setup. 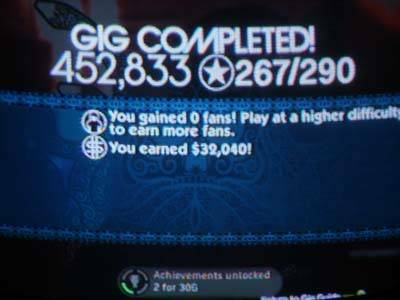 I did the same song on expert Jinzo. 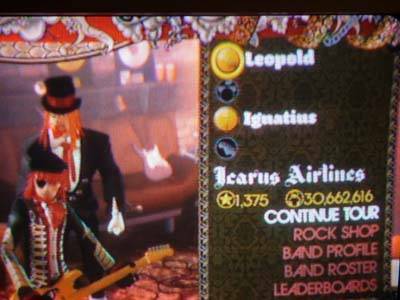 I did Expert Guitar/Easy Vocals. I sucked, because I don't have a miuc stand, and I had to use a rubberband to tie my mic to my guitar. Impressive I do suppose. What I really want to do is find a way to set up my mic on my drum set (which now has a broken pedal...) and not have it pic up the banging but that's a tough thing. What I have set up for guitar is a coat hanger on a dresser door hinge so it's just about mouth height. For being the first time I tried it, I was impressed with myself. I nearly failed Train Kept a Rollin' and Flirtin' with Disaster with the same setup, but I pledge to keep at it. This gives me much more satisfaction then just beating one instrument. And! I'm terrible at singing while playing. I 'm hoping this gives me some training for it. At the end of the day it's good in the long run.